Fill The Flute has belied her inexpensive price tag with an all-the-way win at Moonee Valley. 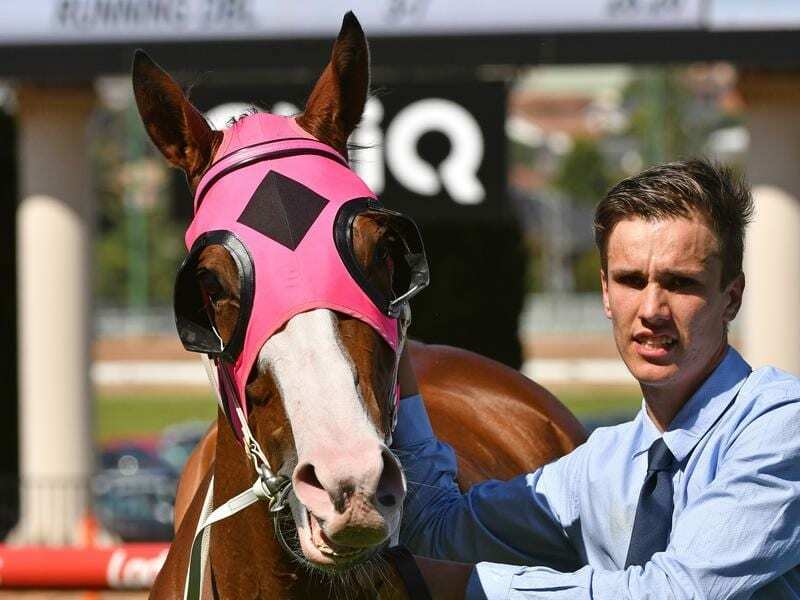 A mare bought cheaply as a weanling to be a paddock mate for another young horse has emerged as a winning machine for trainer Jamie Edwards and connections. Fill The Flute continued an unbeaten preparation at Moonee Valley on Saturday, registering her fourth victory from as many starts this campaign in the $100,000 Spendthrift Australia Handicap (1000m). It took the four-year-old’s overall record to five wins from nine starts and prize money of $137,070. Not bad for a horse bought for $7000 in 2015 when Edwards sent his son James, now the trainer’s assistant, to buy a weanling as a companion for another weanling filly in the stable. “We had another filly that we needed a mate for so I sent my son to the sales with ten grand and said ‘go and buy a horse’,” Edwards said. Not only is Fill The Flute, by Statue Of Liberty out of Dom Perion, making her own mark on the racetrack as a multiple city winner, her pedigree has also been given a boost during the recent spring carnival by the performances of her younger half-brother. “The irony of this horse is that she’s a half-sister to Extra Brut who won the Victoria Derby,” Edwards said. Well placed by Edwards, Fill The Flute won a 1000m benchmark-58 at Geelong first-up in September before a win at Morphettville and two at the Valley. Apprentice Georgina Cartwright is unbeaten on the mare having been aboard in the past three starts. Cartwright said what was even more special about the victory was that she used to be apprenticed to Edwards and had an association with Fill The Flute from when the mare first arrived at the trainer’s stable. Edwards believes Cartwright’s 3kg claim was an asset in Saturday’s front-running victory, with $3.20 favourite Fill The Flute beating Grey Shadow by three-quarters of a length with a short-head to Essence Of Terror third. “She’s very fast. How good she is, I don’t know,” Edwards said.